Be the first to share your favorite memory, photo or story of Teresa. This memorial page is dedicated for family, friends and future generations to celebrate the life of their loved one. 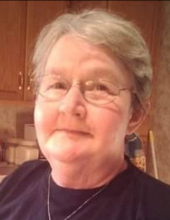 Aberdeen – Teresa Blythe, 65, passed away Thursday April 11, 2019. Teresa was born July 6, 1953 in Robertson County to the late Roscoe and Estelena Linville Fite. She was a former employee of U.S. Shoe, working at both the Ripley and Flemingsburg locations. Survivors include her Son, Ernest Blythe, Jr. of Aberdeen; a sister, Dorothy Frye of Tollesboro; a brother Roy (Cathy) Fite of Aberdeen; a brother-in-law, Dale Osborne; sisters-in-law, Charlotte Fite, Dixie Fite and Donna Fite; several nieces, nephews, great nieces and nephews, and great-great-nieces and nephews. In addition to her parents, she is preceded in death by her husband Ernest Blythe; sisters Nancy Osborne, Betty Linville, Doris Fite, and Judy Caldwell; brothers Bob Fite, Wayne Fite, Jimmy Fite, Richard Fite, and Ronnie Fite; and brothers-in-law, Lonnie Frye and Leonard Caldwell. Services for Teresa Blythe will be held at 1:00 p.m., Sunday April 14, 2019 at Brell & Son Funeral Home. Burial will follow in Charter Oak Cemetery. Visitation will be from 11:00 to 1:00 p.m. Sunday. Pallbearers will be Billy Ray Fite, David Ray Fite, Wayne Fite, Jr., Ritchie Frye, Dale Osborne, and Kenny Batchelor. To send flowers or a remembrance gift to the family of Teresa Fite Blythe, please visit our Tribute Store. "Email Address" would like to share the life celebration of Teresa Fite Blythe. Click on the "link" to go to share a favorite memory or leave a condolence message for the family.